Information about cancer risk can help you make informed decisions about screening and prevention strategies. As we recognize National Men’s Health Week, learn about the most common cancers in men in the United States and the options for prevention and treatment. There will be an estimated 180,890 new cases in the U.S. in 2016. One in six men will be diagnosed with prostate cancer in his lifetime. Doctors can screen for early signs of prostate cancer with prostate-specific antigen testing, which can detect elevated levels of a protein in the blood that may indicate prostate cancer. There are benefits and drawbacks to PSA testing; it can help detect and treat cancer at an early stage, but it is not always accurate. False readings can lead to unnecessary treatments, including biopsies that can increase the risk of impotence and incontinence. Age 18-40: Screening is usually not required. Age 40-49: You should discuss your risk level with your physician. Screening is recommended if you are considered high risk. 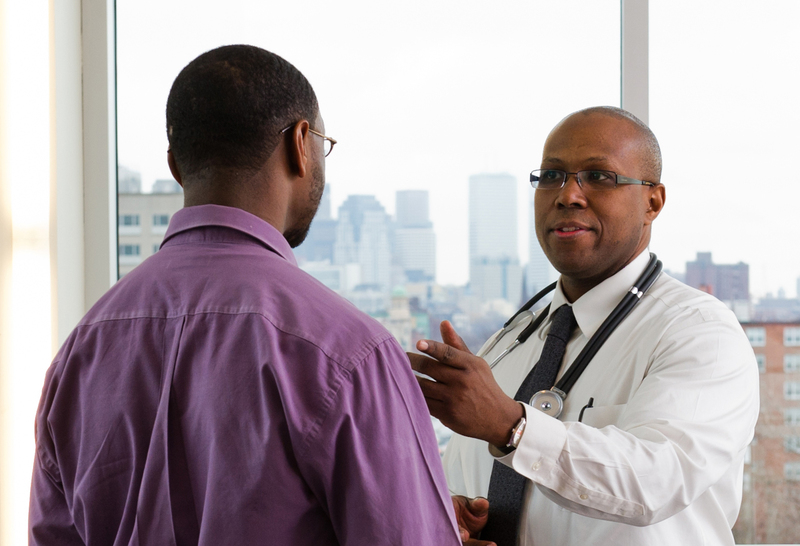 African-American men and men who have a family history of prostate cancer are at a greater risk and should discuss PSA testing with their physicians. Age 50+: Discuss screening with your physician. The best protection against prostate cancer is a healthy lifestyle. Follow this game plan for preventing, screening, and treating prostate cancer. There will be an estimated 117,920 new cases in men in the U.S. in 2016. Both smokers and non-smokers are at risk for lung cancer. Talk to your physician about screening and prevention if you experience symptoms of chest discomfort, difficulty breathing, hoarseness, bloody mucus, and a lingering cough. Smoking is the number one risk factor for lung cancer. You can call the Smoker’s Helpline (1-800-QUIT-NOW) to learn about programs to help you quit smoking, or you can discuss how to quit with your physician. The U.S. Preventative Services Task Force recommends annual lung cancer screenings for current smokers, those who have quit smoking within the last 15 years, and those ages 55-80 who have smoked a pack a day for 30 years. Screenings consist of a low-dose CT scan. To further reduce the risk of lung cancer, maintain a healthy diet and avoid secondhand smoke and exposure to carcinogens such as radon, asbestos, and soot. Radon exposure is the main cause of lung cancer in non-smokers and can be detected inexpensively with an in-home testing kit. There will be an estimated 70,820 new cases in men in the U.S. in 2016. Colorectal cancer is a common but preventable disease. Risk factors for colorectal cancer include age, a history of polyps, having inflammatory bowel disease (IBD), a family history of colorectal cancer, physical inactivity, obesity, and frequent consumption of red meat and processed meats. Studies show that a daily dose of aspirin may reduce the risk of colorectal cancer by up to 40 percent. Consult your physician before beginning an aspirin regimen. Age 18-39: It is not necessary to have a screening unless you have IBD, a family history of colorectal cancer, or a hereditary condition like Lynch syndrome. Speak with your doctor about the pros and cons of screening and whether it’s right for you. Age 40-49: Review your risks with your doctor. You may need to begin screening if you have an increased risk of colorectal cancer or if you’ve previously had polyps. Age 50+: Everyone should be screened. Talk to your doctor about the options, including colonoscopies, sigmoidoscopies, and annual stool occult blood tests. There will be an estimated 58,950 new cases in men in the U.S. in 2016. Blood in the urine, changes in bladder habits, or inability to urinate may be signs of bladder cancer, or signs of a less serious bladder problem. According to the American Cancer Society, you may be able to reduce the risk of urinary bladder cancer by drinking lots of water, eating fruits and vegetables, quitting smoking, and limiting exposure to certain organic chemicals found in workplaces in the textile, paint, rubber, and leather industries. A urinalysis, which tests for blood in the urine, can be used to detect bladder cancers early but may not be useful as a routine screening test. Urine cytology may be able to detect cancer cells in urine. There will be an estimated 46,870 new cases in men in the U.S. in 2016. Risk factors for melanoma include fair skin, a history of blistering sunburns, several large or many small moles, and a family history of unusual moles. To detect melanoma as early as possible, check your skin once a month in front of a mirror in a well-lit room. Make note of any changes in patterns of moles, blemishes, and freckles over time, and use the “ABCDE rule” to help determine whether your physician should look at a mole. Asymmetry. One half of the mole looks different than the other. Border irregularity. The mole has blurry or jagged borders. Color. The mole does not have a consistent color and may have shades of brown, black, pink, white, red, or blue. Diameter. The mole’s diameter is greater than six millimeters (roughly the size of a pencil eraser). Evolving. The mole changes in size, shape, or color.